So here we are at the end of October! As it starts to get chilly out, we are very mindful of ranchers and their plans going into the winter. Plans for running their mother cows through the end of fall into winter at the lowest possible cost, and yet without sacrificing protein, condition and body score. Rather, to ensure that those cows are going into winter in good rig. We are partnering with ranchers across the US and Canada to help them lower their input costs. Helping them to reduce the money they spend on supplements, by stretching their forges and pastures, by getting more out of the resources that they already have. For the team here at Rio Nutrition, there is NOTHING more rewarding than to hear from ranchers that Riomax lick tubs enable them to push back their hay date. In other words, to get by longer without feeding hay. Essentially, the Riomax lick tubs are helping these folks to lower the amount that they spend on hay by managing the resources they have on hand. The key component in our Riomax tubs is "Nutrizorb" a 16-component digestion additive. It helps cows to better digest and utilize the forages they're grazing, whether it be winter pastures, corn stalks, stubble, or hay meadows. Riomax helps ranchers to get their cows in better condition and save money doing it! Many rancher are familiar with the term "protein tub" and there are many reputable companies out there selling protein tubs or blocks. This is called a direct-fed protein source. It's not a bad concept, but it's a bit outdated and not the most cost-efficient for today's rancher. What Riomax brings to the table is an indirect-fed protein. While it not as commonly known, it works by capturing more protein out of the whole diet (pastures, hay, other forages). This indirect fed protein concept is more effective and cost-efficient for ranchers, as you are optimizing the resources you have rather than relying heavily on expensive supplement. At the end of the day, that mother cow has the protein, energy and nutrient requirements necessary. We figured, let's think outside the box and focus on getting those needs met at the lowest cost possible. This all goes back to the conversations that we've had with ranching operations big and small. We can't control the markets or the weather, but we can control our management style, input costs, and efficiency of our winter program. Further to that point of lowering input costs, we want to remind folks that we are focused on providing the lowest cost to feed, per head per day. While the industry buys and sells tubs on a cost per ton basis, again, we are thinking of the rancher: rancher input costs and rancher profitability. We focus on the cost to feed, rather than the upfront cost. 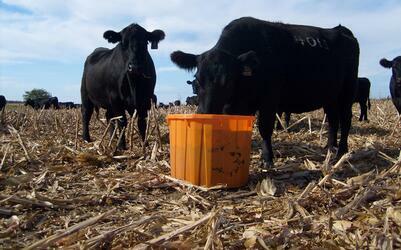 What does this mean for ranchers running cows through the winter? They can do it with it with a low input cost and less labor, all while keeping cows in good condition and preparing them for entering their last trimester. As we say here at Rio, "RioMax Lick Tubs: Enabling ranchers to get their hands on the best of the best for less!" To discuss options for you ranching operation this winter, get more product information or just to crunch the numbers...feel free to reach out to our beef team. Call or text at 888-714-5781 or...if you'd rather, simply fill out our online form. A comment from our owner and founder, Trevor Greenfield, "We have an expression amongst our beef team 'Stop selling and start helping!' - and let me tell you, we'd love to help you out!"